1. Cook the potatoes in a pan of boiling salted water until tender, drain, then cool under cold running. Drain again. 2. 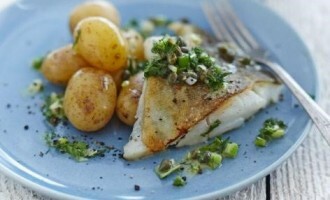 To make the dressing put the capers, dill, mustard, sugar, vinegar and oil in a jar and shake for 1 minute or until combined and the dressing looks a little thicker, pour over the potatoes and stir through the spring onions. Set aside. 3. Dry the cod on kitchen roll 4. Heat a drizzle of oil in a non-stick frying pan then cook the fish skin side down for 3 minutes, this will give you nice crispy skin, flip over and cook for a further 2 minutes. Serve the fish with some potato salad.